A set of sweeping measures looking to drastically change teachers’ collective bargaining rights and how students use technology in the classroom were overwhelmingly voted down by Idaho voters Tuesday. As of 11 a.m. EST on Wednesday, with nearly all precincts reporting, Propositions 1, 2, and 3 were all trailing by double digits. Voters were deciding on the measures after a petition drive to overturn the laws followed their passage by the state legislature last year. 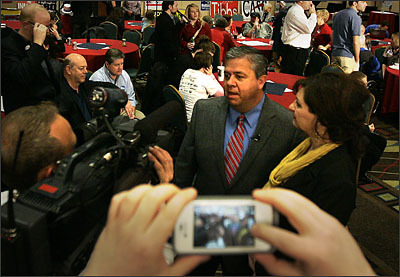 The laws were part of Idaho state Superintendent Tom Luna’s controversial reform plan, which originated from the state’s application for a federal Race to the Top grant and was backed by Gov. C.L. “Butch” Otter. More than $6 million combined was spent on either side of the debate, making it one of the most hotly contested ballot initiatives in the state’s recent history, and one of the more consequential ballot measures in the country. Proposition 1 would have limited teachers’ collective bargaining rights by giving expanded authority to local school boards and would have phased out tenure, forcing teachers to work on one- to two-year contracts. It would also have tied 50 percent of a teacher’s evaluations to student academic performance. Vote No on Propositions 1, 2, 3, the group that opposed the laws and was backed by the National Education Association, warned that the voice of those in the classroom would be weakened. Proposition 2 would have established a $38 million performance-based pay system for teachers, based in part on academic-performance metrics like state median assessment scores and growth and success in meeting targets for adequate yearly progress. Proposition 3, which was repealed by an even larger margin than the other measures, would have been one of the most significant statewide online learning measures passed by voters. Every high school teacher and student would have received a laptop computer, and students would have been required to earn two credits through online or blended learning courses in order to graduate. Vote No on Propositions 1, 2, and 3 contended the measure would have diverted taxpayer dollars to technology corporations and marginalized teachers. In the days leading up to the election, Luna announced an eight-year, $180 million laptop contract with Hewlett-Packard. Idaho’s upcoming legislative sessions could still provide opportunities to enact new laws, but lawmakers would have to do so without much support from the public. Idaho leans heavily Republican, but the overwhelming repeal of the measures shows the nonpartisan nature of many debates on reshaping education. In Indiana, we already saw Democrat Glenda Ritz defeat incumbent state Superintendent Tony Bennett in a conservative-leaning state. (At the same time, a ballot initiative in Republican-heavy Georgia to establish a statewide charter school commission passed.) For more on state voting results that will affect education, visit our Voter’s Guide. Bloomberg and $250,000 from Joe Scott, an heir to Albertsons, a grocery-store chain. Additionally, Idaho businessman Frank VanderSloot put $1.4 million of support behind the propositions, while the National Education Association donated more than $1 million opposing the measures. Three more victories for public education. To determine if your educational system has become anachronistic, answer some pertinent questions. Is your school inside your iPad, or is your iPad inside your school? Is your school open 24 hours a day, or do chains go on the doors at night? Is your school library more likely to have one physical book that can be checked out by one student at a time, or one digital book that can be “checked out” by thousands of students at a time? Do students turn in their homework on flash drives? Does your school offer cloud storage and file sharing to students and teachers? Do you really have any idea what “online learning” is? page where each learner or university student can find results grade point average levels.